Thanks to everyone that submitted to the contest, and congratulations to our winners! Additional postings will be post on The Shifter Archive website in a day or two. Winners, if you see this post before you get an e-mail, you will also be mentioned on the Webcomic Beacon when we record later today. Fes, Tanya, and Aaron are joined by Tanya Higgins and Scary Voice Mr. Christopher Solace of A Better Way Merchandising Service (Launching Aug 12th). They also demonstrate how we use the show for shameless self promotion. 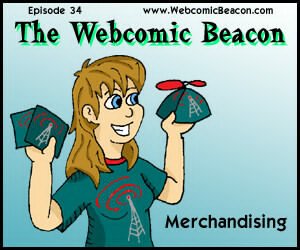 But we do talk a good deal about merchandising for a webcomic and we glaze over putting up a store. This week we set our Beacon Searchlight on Hexagon Death Squad! Don’t forget the Strip Fight.org Weekly Ringside Update! Milestones reported this week: Rooster Teeth Comics (300), Amazoness (100), Questionable Content (5-Years). Also, don’t forget to vote for the Jenny Everywhere “Draw” to Win contest! Right here on The Webcomic Beacon, brought to you by The Shifter Archive and WAGON Webcomic Battle! Voting Ends Saturday night! Fes and Tanya start talking about some conventions for a little bit, but not before talking about ADHD, Scooby Doo, and riding bikes… Um… what else? Oh yea, then we eventually moved on to self insertion. 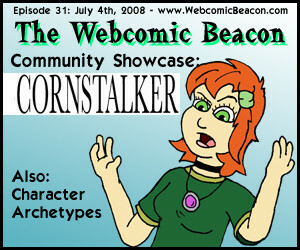 This week we set our Beacon Searchlight on Steal This Comic! Don’t forget the Strip Fight.org Weekly Ringside Update! Milestones reported this week: Dreamland Chronicles (700 Strips), Synthetic Life (200 Strips), Orange Hat Girl (1 Year), X, Why (100 Strips). We also bid farewell to Minus and Zortic. Fes and Tanya talk about those webcomic list sites, such as The Webcomic List, where you can submit your webcomic to an ever expanding index. 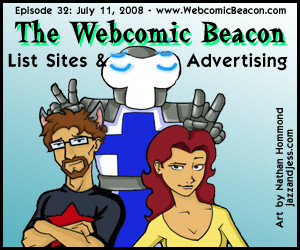 We also talk about advertising your webcomic through services such as Project Wonderful. Also, this week’s cover is from Nathan Hommond of Jazz and Jess.com. Another great way to advertise, by sending in Fanart! Mark Savary reviews Set Apart this week, and we set our Beacon Searchlight on The World Explodes! Don’t forget the Strip Fight.org Weekly Ringside Update! Don’t forget the “Draw” to Win Contest! in conjunction with The Shifter Archive! Ends July 21st! Dawg and Komiyan of the Cornstalkers joins Fes and Aaron for another Community Showcase! Afterwards we discuss Character Archetypes in webcomics! 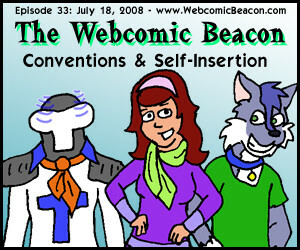 No review this week, but we set our Beacon Searchlight on Insert Comic Here! Plus the Strip Fight.org Weekly Ringside Update! Milestones reported this week: Calamities of Nature hits 1 year and Extra Life hits 7 years & 900 strips! Also don’t forget the “Draw” to Win Contest! in conjunction with The Shifter Archive! Notes: Sites mentioned this week: Angry D. Monkey, Darken, Cortland, Point Guardian, Super Fight Fight, Legostar Galactica, Reckless Youth, Pimpette & Associates, Elf Only Inn, Oops, Nevermind, The Green Avenger, Tales of the Traveling Gnome, Tales of Pylea, Knights of Vesteria, AntiBunny, Unamused Comics, Ugly Girl, Commissioned.